The Persian army was divided into regiments of a thousand each, called hazarabam. Ten hazarabams formed a haivarabam, or division. The best known haivarabam were the Immortals, the King’s personal guard division. The smallest unit was the ten man dathaba. Ten dathabas formed the hundred man sataba. 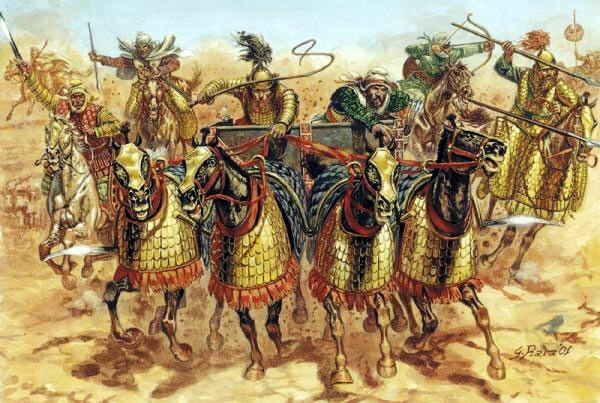 The Persian army comprised infantry, cavalry, charioteers, archers, engineers, and naphtha throwers. In its early days Cyrus’s army had few cavalry, and the normal mix of infantry to cavalry was 90 percent to 10 percent. After Cyrus, the ratio changed to 80 percent infantry to 20 percent cavalry, with the Persians and Medes comprising the bulk of the heavy cavalry as the elite striking arm. Cyrus realized the importance of cavalry to an army that had to move quickly over long distances and fight in many different types of terrain. He personally forged the Persian cavalry into the world’s largest mounted army. The greatest number of Persian cavalry were light cavalry armed with the simple bow (noncomposite) and comprised mostly of irregular nationality troops officered by Persians. The tactical role of this light infantry was to harass the enemy and draw it into battle. The elite of the Persian army was the heavy cavalry, made up almost exclusively of Persian regular units. In its early days the cavalry was armed with the standard weapons of the Persian infantryman: the bow, battle-axe, and oval shield. Later, heavy cavalry was equipped with the short stabbing and throwing javelin. Long lances made of wood or entirely of metal, oval shields, and spears were also used. The javelin, properly so called, was invented by the Persians and later adopted by Alexander for use by his Greek cavalry. It was a short spear about a yard long made of date palm wood, thick reed, or the wood of the jujube tree. It was tipped with bronze or iron. The Persian javelin could be thrown like a spear, used as a stabbing weapon, or even thrown end over end. Each heavy cavalryman carried two javelins as a basic combat load. Cavalrymen wore body armor made of a heavy leather coat covered with overlapping disks of bronze, iron, and sometimes gold. Armor was often colored in order to distinguish one unit from another. Leather greaves protected the cavalryman’s legs. Personal protection was augmented by a small oval shield made of leather with a metal rim. Two holes were pierced in the upper shield near the top rim to permit the soldier to see through the shield when engaged in battle. Very nice! I needed this for school!